Hairy Maclary is a rather odd looking dog. He is also a very lucky dog because he has a friend at the local butcher’s shop. Mr. Samuel Stone gives our hero a bone, a delicious bone. In no time Hairy Maclary has a collection of dogs following him down the street. They all want that bone, that wonderful smelling bone, that delicious looking bone. Hairy Maclary may be funny looking but he is also very smart. As he heads home to the dairy where he lives, Hairy Maclary takes a very circuitous path. The end result is that before long, his train of hungry dogs has been left behind. One is stuck in a fence, another is trapped in a hedge and so on. With amusing names, delightful illustrations and a simple story, Lynley Dodd has created a charming book for youngsters. 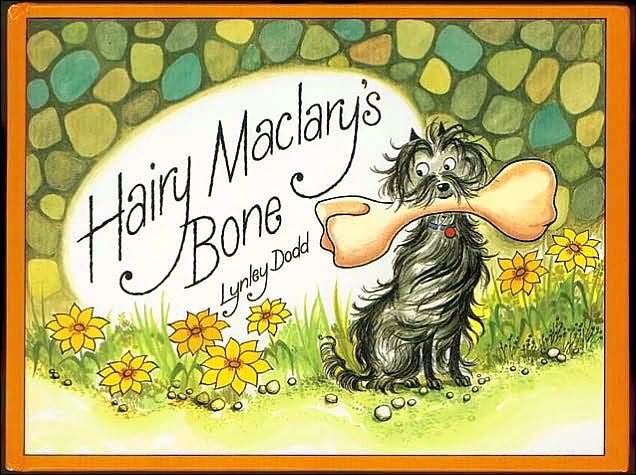 A perfect read-aloud book, "Hairy Maclary’s Bone" is one of several books about this intelligent and comical dog.